How easy is it to enter an appointment? Some software requires you to enter too many pieces of information before you can save the appointment. If a software vendor is doing a demonstration for you, pay attention to what is involved in entering an appointment. 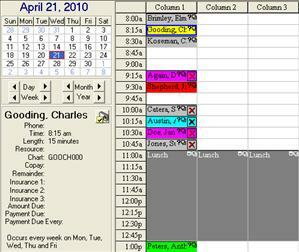 What looks easy during a demo may not be when you are using the scheduler every day. Ask the vendor to let you enter an appointment yourself. Is the screen easy to navigate? What are the default appointment time intervals? Can they vary by provider? Dr. Smith sees patients for a minimum of 15 minutes. Dr Jones sees patients for a minimum of 10 minutes. Can the intervals be different? Can I set breaks and block out times when the provider is out of the office? Many scheduling programs do this but some do it better than others. I have found that the schedulers imbedded in medical billing software are sufficient unless a practice has very heavy scheduling needs. Software programs designed specifically for scheduling have better features but they don't necessarily integrate with medical billing software. If possible, it is best to stick with an integrated system. Can I use a different color for each appointment type? Can I see appointments for several providers at once? A medical office is a busy place. You need to be able to see as much as possible with the fewest mouse clicks. That’s why screen design and navigation is important. Can I enter repeating appointments? This is an especially helpful feature for a chiropractic or physical therapy office that makes repeat appointments for several times a week, several weeks in a row. It's a huge time saver. Can I see the patient remainder balance and copay amount on the appointment? This is critical information. Efficient practices collect as much money as they can when the patient is in the office. Statements are expensive to mail. Patient remainder balances should be easy to find. Is there a place for an appointment note and how long is that field? Does it appear on the superbill or fee slip? Some offices require a lot of note details, especially surgeons. Also, the ability for this information to flow through to the superbill can be helpful. How do I look up a patient’s past and future appointments? Can I tell how many appointments have been missed or noshows? It is important to easily access the appointment list by patient. Part of the advantage of having a patient scheduler is to be able to look up appointments when patients call to confirm an appointment date. The patient scheduler is one of the most important features of your medical billing software. Find out what it will do for you before making your software purchase. Please contact us if you would like information about the appointment scheduling software we sell and support.